Our Parish is deeply indebted to all who give the gift of their time and talent to participate in a Ministry or Group within the parish. We thank all who coordinate the members in these groups. New members are always welcome. At least once a year their is a specific invitation for parishioners to volunteer for the groups which assist the liturgy. If you are interested in establishing a new group or finding out more about joining a group, please contact the parish office. The parish finance committee assists the parish priest in all aspects of parish finances. The counters are responsible for counting and recording the monies collected in the church during masses on Sundays and holy days of obligation. The Altar Society organises the flowers for the altar and side altars. It also takes care of the altar linen and the shrines. All parishioners are responsible for the ministry of consolation. The Baptism team assists families to prepare for the baptism of a family member. These are committees of catholic parents who organise the religious instruction of children attending our Catholic schools. On Sundays and feast days the collectors ensure that the assembly is facilitated in making its monetary offering to the Lord. Collections for the poor and needy are ancient traditions in the life of the Christian Community. The collections help remind us of those who are less fortunate than ourselves. Altar servers are participants who serve at the liturgy by assisting the presider and the assembly. 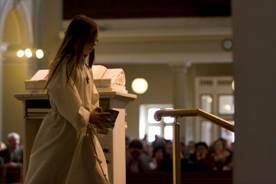 This Ministry creates an opportunity for participation in the liturgy at a young age. It also provides an opportunity for adults to serve at the liturgy. Ministers of the Eucharist are called to participate in the distribution of Holy Communion during the Liturgy. They also bring Communion to members of the Parish who are housebound. In the Ministry of the Word, members of the Parish are trained to proclaim the word of God. The Bethany bereavement support group is a voluntary parish based ministry, which aims to help the bereaved and grieving. The name “Bethany” recalls the visit of Jesus to Mary and Martha on the death of their Brother Lazarus. When Jesus saw her weeping and the Jews who had accompanied her also weeping, He was troubled in spirit, moved by the deepest emotion. “Where have you laid him?,” He asked. “Lord, come and see”, they said. Jesus began to weep”. John 11:33-35. The society exists to foster vocations to the Priesthood and religious life at Parish level. This is a lay catholic organisation founded by Frederic Ozanam. This is a catholic organisation of lay people, who gather to pray. It is involved with pastoral outreach in response to local needs with the spirit and solicitude of Mary. Meets in the Parish Centre – Fri 7.30 – 9.30pm.